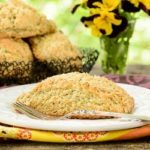 These Lavender Poppy Seed Scones are a wonderful breakfast treat. They are moist and have a delightful tiny crunch from the poppy seeds. Preheat oven to 375°F. Line a baking sheet with parchment paper or non-stick liner. Grind lavender and 1 tablespoon turbinado sugar in a spice or coffee grinder until it is a finely ground (like a powder). Whisk together lavender powder, flour, oats, granulated sugar, poppy seeds, baking powder, baking soda, and salt in a large bowl. Use a pastry blender to cut butter into dry ingredients until the dough is crumbly. Add buttermilk and stir a wooden spoon until dough mostly comes together. Turn out dough on a work surface and knead gently until dough comes together. Shape dough into a circle about 2 inches thick. Cut dough into 8 wedges and transfer wedges to prepared baking sheet. Brush wedges with cream. Sprinkle remaining turbinado sugar on top. Bake for 22 minutes or until scones are lightly browned. Cool on a wire rack. Best served warm and on the day they are made.